Written post October snow storm. Soho was very quiet the morning after the bizarre and historic October snow. While everyone slept, I found the perfect moment to escape into Nomad a global approach to interior style, a new book from Sibella Court. Nomad, follows her previous books, A Stylists Guide to NYC and Etcetera. Her book is a personal journey of her travels that inspire her sense of style , her interiors and her soul. There is a story about about her mother that is both incredibly real and personal. This is not just a book of suggested places to visit, it it a personal journey. I worked with Sibella, a kindred spirit, many times during her stay in New York and I was always inspired by the bits and pieces of travels she carried with her to every shoot. Like a tiny Weaver or Bower Bird she constructs the most elaborate nests wherever she is, pebble and shell, pieces of string, fragments of fabric all find their way to her into her pockets and onto her walls, sets and tableaus. Nomad is divided into sections by country. She covers Italy, India, Syria and Mexico. Sibella gives a personal account of travels through these countries and takes us to some of her favorite places. There are many beautiful travel photographs that make me want to pack my bag and hit the road. I have said before that I too collect things on my travels, like sea salt and honey, but it really goes far beyond that. On my last trip to Istanbul I had an entire fleet of paper cups wedged into my tripod bag, as they were just too beautiful to leave behind. I am a pilferer of matches and menus as well. I too am always looking for bits to bring home, things that remind me of a place or something I can later use in a shoot. I am a bit of an obsessive collector in that way and that is one reason I enjoy working with stylists who share that same obsession. Last April, I was in India on assignment for Conde Nast Traveler. The days were hectic and the weather in the Northern Himalayas was unseasonably bad! A monsoon had rolled in and threatened to eradicate all blue skies with blinding rain and wind. It was one of those times that we had to wait it out a bit, something which is very hard for me to do when I am on a job. After giving in to the weather one evening we decided to take a couple hours and travel the twenty minutes down to the town. 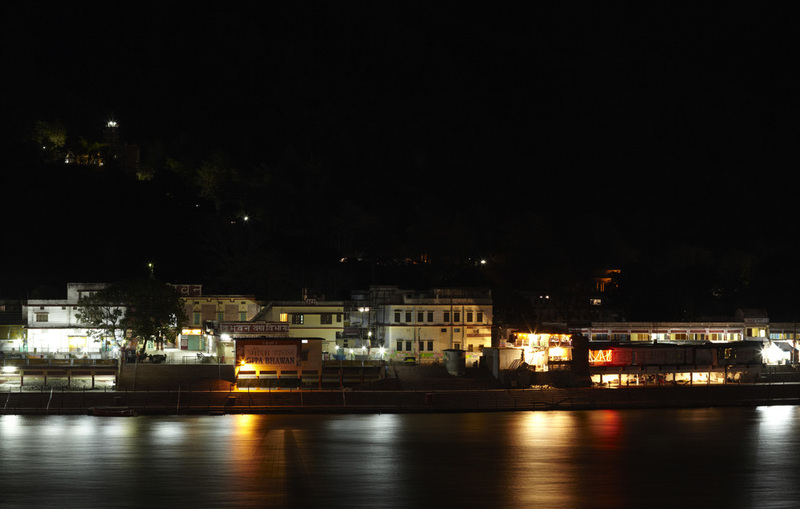 The town of Rishikesh is really very special as it marks the beginning of the River Ganges as it comes down from the Himalayas. The river is very clean there and it is a very sacred place. The Beatles wrote most of the White Album in Rishikesh in 1968 when they visited the now closed Maharishi Mahesh Yogi's ashram. Even in the rain, the little riverside town at the edge of the Ganges was busy with activity. We sat through Ganges Aarati ceremony, performed each evening at sundown at the Parmarth Niketan Ashram and listened to the most beautiful chanting and watched brilliant flowers and candles of offerings float silently along the river. After the ceremony we walked across a suspension bridge over the Ganges to the other side of town where the evening market was taking place. Single light bulbs hung on cords illuminating each vendors stall like a perfectly styled theatrical stage. One thing I have found is that markets stay open quite late in other countries ( it was on this same trip, though in another country, that we found ourselves making our way towards a hidden spice market on the outskirts of Dubai at nearly midnight!) It was in that hour or so in Rishikesh that I found some of my favorite souvenirs. A brass Ganesha, some ribbon, two pairs of tiny handmade shoes a pair of scissors some prayer beads and a medallion, but more than these it is the image of the little town in the blue evening , music floating up between the mountains that I will never forget. Like Sibella, I am inspired by travel and try to make the most of wherever I am at any given moment. I carry my finds home where they work their way into our lives. These bits are always there whether in a box of treasures or on the wall to remind me that I really did stand at the edge of that river clear across the globe. You can buy Nomad at Anthropologie. And visit Sibellas shop The Society Inc. in Sydney Australia where she has landed.